Business performance may seem undervalued or overvalued if accruals and deferrals are not used correctly in the accounting. Accruals and deferrals occur only when a business uses accrual-based accounting methods. If accruals and deferrals are not used correctly in the accounting cycle, certain accounts may seem undervalued or overvalued. 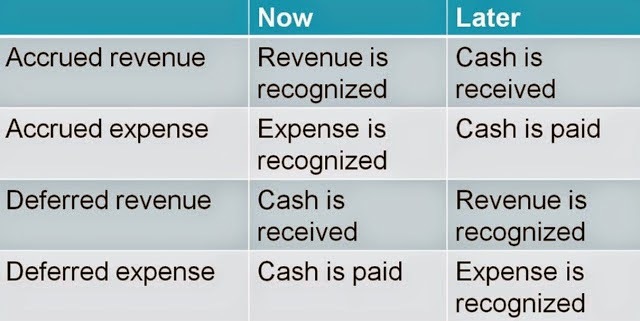 Under the accruals, conditions are satisfied to record a revenue or expense, but money has not changed hands yet. An accrual occurs before a payment or receipt. Under the deferrals, money has changed hands, but conditions are not yet satisfied to record a revenue or expense. A deferral occurs after a payment or receipt. Read full article "Accruals and Deferrals"
The strange accounting that tripped up Bank of America is on its way to being changed. That accounting rule has been around since 2007. The rule has provoked a lot of criticism about how ludicrous accounting results could be, and the people who write the standards have been moving to change the rule. Just last week, the Financial Accounting Standards Board tentatively agreed, on a 5-to-2 vote, to end that practice at a date to be determined. The existing rule applies to companies that adopt what is known as the “fair value option” for financial assets and liabilities. In practice, that mostly means large banks. Under the rule, they mark certain assets and liabilities to market value each quarter and reflect the net change in their income statements. That made sense when it was originally adopted in 2006, when the quality of bank credit was generally taken for granted. If a bank issued a bond that matured in 10 years and at the same time made a 10-year loan at a fixed interest rate, marking the asset — the loan — to current value might make no sense unless the value of the liability — the bond — was also changed. If interest rates rose, the market value of the loan would fall. Should that lead to a loss? No, because the value of the bond would also fall. Then Lehman Brothers failed, and suddenly the assumption of unvarying credit quality among large banks no longer made any sense. The result was that in 2008 and 2009, the market value of bonds issued by big banks fell, and their reported profits were increased. Then in 2010 and later, the banks appeared to be in better shape, and the market value of their bonds rose. That cut reported profits. Bank regulators understood that — whatever the accounting rationale — it made no sense to raise or lower a bank’s profits because its credit standing had changed. Banks would ultimately pay their liabilities in full or they would fail. So the regulators told the banks to disregard those adjustments in calculating capital. And Bank of America did that. The bank said on Monday that it mishandled the adjustments to its capital. It says that it properly raised its reported capital levels to offset the reported loss caused by unrealized changes in the valuation of the securities it had issued. But it also raised the capital levels to offset losses that had been realized, something it should not have done. The realized changes came when securities issued by the bank were paid at maturity or repurchased at an earlier date. That mistake improperly increased its reported capital. Four former leaders of the once-high-flying law firm Dewey &amp; LeBoeuf violated a rule that lawyers always tell their clients: Don’t put anything incriminating into an email. The former top officers, who were charged by New York prosecutors on Thursday with orchestrating a nearly four-year scheme to manipulate the firm’s books to keep it afloat during the financial crisis, talked openly in emails about “fake income,” “accounting tricks” and their ability to fool the firm’s “clueless auditor,” the prosecutors said. The messages were included in a 106-count indictment against Steven Davis, Dewey’s former chairman; Stephen DiCarmine, the firm’s former executive director; Joel Sanders, the former chief financial officer; and Zachary Warren, a former client relations manager. They were charged with larceny and securities fraud. One of the men even used the phrase “cooking the books” to describe what they were doing to mislead the firm’s lenders and creditors in setting the stage for a $150 million debt offering that was supposed to solve the firm’s financial woes, according to the messages. “Those at the top of the firm directed employees to hide the firm’s true financial condition from creditors, investors, auditors and even partners of the firm,” the Manhattan district attorney, Cyrus R. Vance Jr., said at a news conference announcing the indictment. At its peak, the combined firm had 26 offices around the globe and employed more than 1,300 lawyers. The $550 million in claims against the firm’s estate made it the largest bankruptcy filing by a law firm on record. Prosecutors contend that the accounting games at Dewey began in November 2008, not long after the merger was completed, and continued until March 7, 2012, a little before Dewey filed for bankruptcy two months later. The firm found it could not meet provisions in bank loans that required it to meet certain cash-flow projections. To make it appear as though Dewey was meeting those conditions, the top executives schemed to make a series of fraudulent accounting entries that either increased revenue, decreased expenses or appeared to rein in distribution payments to partners, prosecutors said. Mr. Davis and his team had hoped that the firm’s revenue would eventually increase as the economy recovered. But by the end of 2009, Dewey owed its bank lenders about $206 million, needed to make payments totaling $240 million to its partners, yet had just $119 million in cash. Asset allocation refers to the balance between growth- and income-oriented investments in a portfolio. This allows the investor to take advantage of the risk/reward trade off and benefit from both growth and income. Building an appropriate asset mix plays a determinant role in a portfolio's overall risk and return. A portfolio's asset mix should reflect goals at any point in time. Asset allocation can be an active process to varying degrees or passive in nature. Asset allocation strategies listed should be used only as general guidelines on how investors may use asset allocation as a part of their core strategies. Read full article "Portfolio Asset Allocation Strategies"